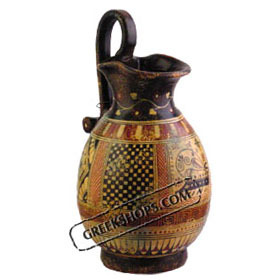 Hand-made ceramic copy of a Greek Geometric Oenochoe ( wine jug ) from the 8th Century BC. Different designs painted on front and back, along with traditional geometric Greek key band. See additional photos for details. A beautiful additional to your household, or a wonderful gift. Approx. 15 cm in height (5.9").